EIA’s May Short-Term Energy Outlook (STEO) forecasts that Brent crude oil prices will average $71 per barrel (b) in 2018, $7/b higher than last month’s STEO. 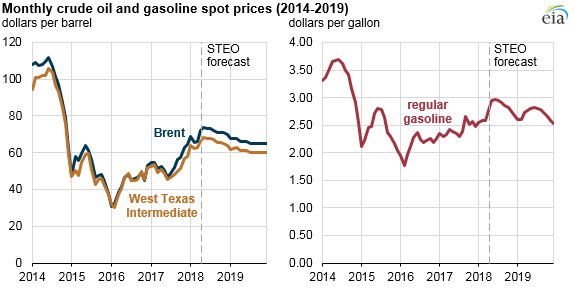 Correspondingly, EIA’s forecast for regular gasoline retail prices increased to an average of $2.79/gallon (g) in 2018, $0.15/g higher that in last month’s STEO. Monthly average Brent crude oil spot prices have increased in 9 of the past 10 months, most recently averaging $72/b in April. EIA expects West Texas Intermediate (WTI) crude oil prices to average $5/b lower than Brent prices in 2018. Even though WTI is a domestic crude benchmark and Brent is an international benchmark, gasoline prices in the United States tend to follow Brent. In late April 2018, daily spot prices for Brent crude oil reached $76/b, the highest level in nearly four years. Crude oil prices have probably been driven higher for three reasons: falling global oil inventories, heightened market perceptions of geopolitical risks, and strong global economic growth signals. 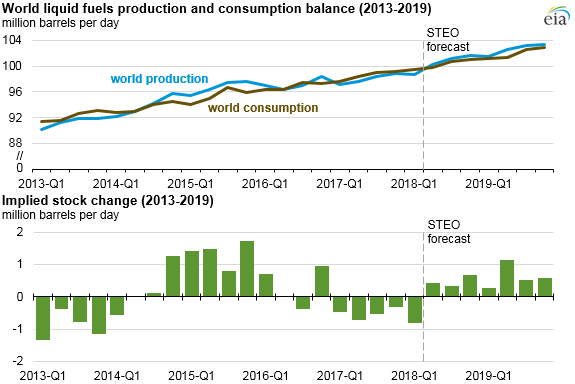 EIA estimates that global oil inventories fell an average of nearly 0.6 million barrels per day (b/d) in each of the past five quarters (January 2017 through March 2018). Oil inventories for countries within the Organization for Economic Cooperation and Development (OECD) at the end of April were an estimated 3% lower than the previous five-year average (2013–2017) in terms of days of supply, the largest percentage below the five-year average since March 2014. In April, when EIA developed the May STEO, several geopolitical risks presented sources of uncertainty. These risks, including the re-imposition of oil sanctions against Iran and the upcoming results of May elections in Venezuela, may materialize into actions that remove oil supplies from the global market and, in turn, tighten global oil balances. Since the publication of the May STEO, the United States announced that it would withdraw from the Joint Comprehensive Plan of Action with Iran. This news and resulting price movements are not reflected in the May STEO, issued May 8, but EIA will consider these developments when formulating the June STEO. At the same time, global liquid fuels consumption is quickly increasing. EIA estimates global oil consumption-weighted gross domestic product (GDP) growth for 2018 will be at its highest rate since 2012. Greater GDP growth has the potential to increase oil consumption beyond forecasted levels, which could put upward pressure on crude oil prices, and simultaneously drive systemic market movements in equities, bonds, and other commodities, which are often correlated with movements in crude oil prices. More information about EIA’s forecasts for near-term energy consumption, production, prices, and more is available in the latest Short-Term Energy Outlook.